2 Bedroom 1 Bathroom With Shenandoah River Access. Private Rural Setting. Just 90 miles from Washington, D.C., and convenient Northern Virginia, Page County, Virginia has preserved the rural charm of its agricultural past while developing a true playground for those interested in cycling, hiking, canoeing, and other outdoor activities. 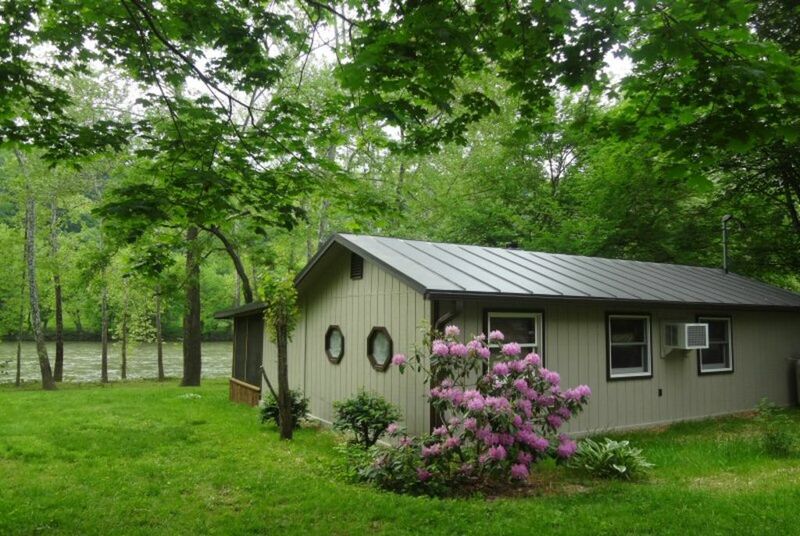 The cabin rental is located on the Shenandoah River, just a short drive to Shenandoah National Park, it offers the best of both worlds- the river and the Blue Ridge Mountains! Within 5 miles of Ralph Dean Recreation Park, Luray Caverns, Luray Zoo. If you like golfing, visit the Luray Caverns Country Club. Enjoy the nearby hiking and biking trails in the George Washington Forest, Skyline Drive or The Appalachian Trail. Go for a horseback ride at Jordan Hollow Stables or Fort Valley Stables (30 minutes away). There are 2 canoe outfitters within 5 miles, take a breathtaking float down the Shenandoah River. Our Virginia cabin rental is the perfect place for you to get away and unwind. Maximum occupancy is 6 but it is the perfect romantic couple getaway as well. You can enjoy our year round vacation rental in Luray, Virginia which offers a variety of restaurants, galleries, gift shops and antique shops. If you love the outdoors, then this is the place! Horseback riding, fishing, rafting, canoeing, Skyline Drive ,visit world famous Luray Caverns, or spend some time hiking in Shenandoah National Park. If you are looking for a romantic getaway, you found it here! Spend some time reconnecting with one another in our private riverfront cabin on the Shenandoah River. This is the perfect place to get away from it all and just relax. Thank you for your positive review. We would like to welcome you back in the future. This is the perfect cottage for a river getaway. Right on the river, a clean cute well stocked and organized little home. Everything you need and more is thought of in the house. It was even decorated for our Christmas visit with a gift waiting for us under the tree!! The swing is on the river, hammock a couple feet away, fire pit picnic table and wood grill all in your own yard .. inside the screened porch is a gas grill and seating to enjoy the view in a protected area... inside the updated kitchen and bath have everything you need or may have forgot to bring. The road leading to the cottage reminds you that you are getting away from the city as you roll through pastures with cows and old riverbeds made into roads. Our winter Christmas getaway as two couples was everything we expected and more <3 I would recommend this home for small families, 2 couples , friends and many other combinations. There are two bedrooms with double/queen and one queen sleeper couch .. we plan to return in the summer for fishing and enjoying getting into the river ! Thank you Paula,we had a very good time ,your hospitality is perfect.Cozy beautiful cabin with beautiful view. God bless you and your business. A mountain retreat with a spring river that form! an awesome eclipse of chill'axin!! PEACEFUL AWESOME EXCITING! THE OUTDOORS BECOME INDOORS THE MOUNTAINS AND THE RIVER ARE SO RELAXING MAKING THIS HUMBLE HOME AN AMAZING ESCAPE! SPRING FEVER IS ALIVE IN EVERY CORNER HERE. BRING YOUR LOVED ONES AND FORGET THE CITY FOR A WHILE!! We had an awesome stay! The cabin was. Clean and had everything we needed plus more. Its a hidden gem and we will be back in the summer. Only complaint is the drive to get there. The road is not paved so it takes a while to drive in and out...so make sure you grab all your supplies from the store because it's not a quick drive out! Thank you for your positive review. We are glad you enjoyed your stay and would like to welcome you back in the future. Within 5 miles of Ralph Dean Recreation Park, Luray Caverns, Luray Zoo. If you like golfing visit the Luray Caverns Country Club. Enjoy the nearby hiking and biking trails in the George Washington Forest, Skyline Drive or The Appalachian Trail. Go for a horseback ride at Jordan Hollow Stables or Fort Valley Stables (30 minutes away). There are 2 canoe outfitters with 5 miles, take a breathtaking float down the Shenandoah River. 100% refund less $35.00 fee 14 days or more notice of cancellation, No refunds with less than 14 days’ notice of cancellation. We do require a signed lease/rental agreement stating you agree to uphold our policies. Guests must visit our website to obtain a copy of our lease agreement. We MUST receive the Agreement before your final confirmation. Check-in at 3 p.m. / Check-out at 11 a.m. unless other arrangements have been made with the owners. Standard rates only apply in off season. Rates are subject to change pending contact with owner/manager-see website @ WWW.WLCABINRENTAL.COM or WLCABINRENTAL@GMAIL.COM for details.